Andrew Hood, grandson of Edison Whitaker Hood, provided this photo, an early school photo showing 19 boys of various ages - the youngest could be 7 or 8 - with two masters; possibly the elder is the headmaster. The boys are thought to be rowers and the photo is likely to include Andrew's grandfather, who also appears in photos of 1913 when he was a member of the Brentford Conservative Rowing Club. This photo was taken by Wakefield of Brentford, possibly in his studio - the background looks rather ornate for a school hall. The boys at the front are barefoot; did they walk along the High Street from their school to the studio? 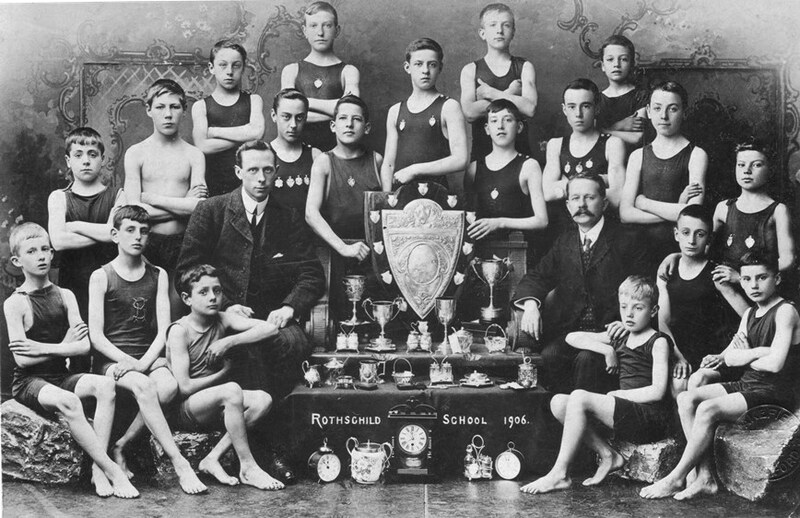 Several of the boys have metal badges and in a few cases the 'R S' for Rothschild School is embroidered on their vests. Turning to the trophies, the most impressive is a shield held by two boys and there are also four silver cups, two clocks, various cut glass condiments sets, bonbon dishes, jam dishes, a jug and more. They must have had an exceptionally good year. As an aside, the two boys at the front left may have six toes, possibly brothers? If you can add any names to the photo please get in touch.